There are several electric commercial griddle models available allowing anybody the chance to claim some fame as a short order chef. A commercial electric grill is larger than the small personal electric griddles available and can accommodate large amounts of food. They are used by food truck owners, school concession stands and for company picnics. If the griddle is manufactured to commercial standards it should be sturdy, serviceable, and most importantly, safe. Commercial models generally offer higher cooking temperature options that personal models so extra care must be taken with the use of one. When deciding which electric griddle commercial model to purchase there are a few t﻿﻿h﻿﻿ings that should be considered as you shop. One important factor to look at is size. How many people will the griddle be used for and how often will it be used? Where will the primary storage place be? Some of the commercial electric griddles are large and require their own place on the counter instead of being stored away when not in use. Another important factor when selecting a commercial sized electric griddle is the size of the grease trap/dripping tray. If the commercial sized griddle has a dripping tray sized for a personal model the grease could overflow before the cooking job is done. Some of the commercial electric grill models do not have an on/off switch so the appliance must be unplugged after each use. An indicator light is an important feature to look for so the griddle won't accidentally be left on. Any steps listed in the instruction manual to prepare the surface for cooking should be followed carefully. Finding the professional griddle that best fits the need is the key to finding the professional griddle that will bring the most satisfaction. The Broil King PCG-10 is a commercial grade electric griddle made from stainless steel and black plastic. It features a 12 1/2in x 29in cooking surface and a removable stainless steel backsplash to minimize splatter. The dripping tray and backsplash are both fully removable for ease of cleaning and the unit is fully immersible when the power/temperature control is removed. The cool-touch stainless steel handles are integrated into one piece with the feet. The feet are adjustable to provide a tilt to the cooking surface in order to facilitate the run-off of grease and liquids when cooking bacon or other meats. The adjustable temperature control allows the user to choose any cooking temperature up to 425 degrees. The griddle comes with a 2-year warranty. Many purchasers expressed extreme satisfaction with this commercial electric griddle. Several business owners such as Bed & Breakfast and caterers reported that the Broil King PCG-10 Professional Portable Non-Stick Griddle is up to the challenge of consistent use on a regular basis. They remarked that the non-stick surface is outstanding at providing superb quality pancakes, french toast, and eggs every time. Users liked the adjustable legs which allow the grease to drain away into the dripping tray. They also reported satisfaction with the large size of the dripping tray for minimizing overflow messes. There were few critical comments regarding this griddle. The complaints that were expressed were small ones. There were a few purchasers who reported that the legs of this unit are made of hard plastic that does not grip the counter so the unit can slide around making cooking difficult. One user suggested the fix of sliding a dish towel under the adjustable back legs of the unit to minimize sliding. Some purchasers liked the product overall but reported that the surface doesn't heat uniformly. A restaurant professional commented in reply that no flat top griddle heats evenly. The heating source will always cause hot spots, no matter the surface. Overall, this seems to be a good choice. Many reports of terrific results when preparing pancakes, eggs, bacon, sausage, burgers, and hot dogs. The unit was not as well liked for grilling steak, chicken or chops. Users reported that it does not get hot enough. The Waring WGR140 14-Inch Countertop Griddle is a commercial grade appliance manufactured from stainless steel and features a 3/8in thick stainless steel cooking surface. This griddle is 9 1/2in in height. 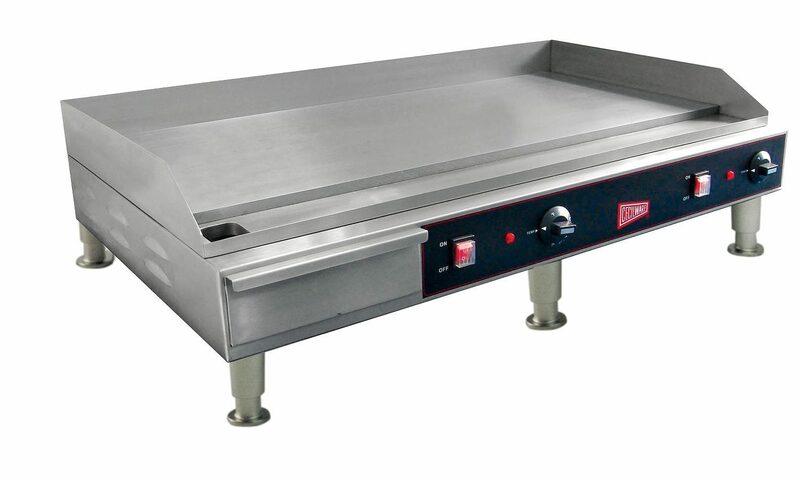 This professional griddle electric model features an 11in fully removable dripping tray which will accommodate a large amount of grease and drippings which can be generated when cooking on an electric griddle of this size. This countertop flat grill includes an extra tall, not-removable stainless steel splashguard for maximum protection against grease splatter. This model has no on/off switch so it must be unplugged after each use. It does, however, feature an indicator light to remind the user that the appliance is still plugged in. It is important to make sure the appliance is unplugged after use and the indicator light is a helpful safety feature. Buyers reported excellent non-stick properties after following the instructions for preparation of the cooking surface. If the stainless steel is not seasoned or is seasoned incorrectly it can affect the performance of the griddle and produce unsatisfactory results. This commercial grill electric model is highly rated by short order cooks and other food service professionals. Several professional users reported high satisfaction with the size of the dripping tray (generally called a grease trap by professionals). They remarked that one of the biggest complaints from home flat top griddle models is the small capacity of the grease trap and the mess that can often result from that. The large capacity commercial style grease trap on this griddle is a welcome feature that most users appreciate. Many users reported that this Waring countertop electric griddle is easy to keep clean and easy to maintain in a condition of readiness for preparing food whenever needed. They commented that it heats up quickly and maintains even heat throughout each cooking job. The variable heat control allows the user to change the temperature setting as needed and features a high-temperature setting of 570 degrees. Users reported excellent results using this commercial griddle to prepare steaks, chicken, chops or burgers. Overall, the Waring Commercial WGR140 Electric Countertop Griddle, 14-Inch, is a well-liked griddle among food service professionals and amateur chefs alike. The Grindmaster-Cecilware EL1636 is a commercial grade electric kitchen appliance that is manufactured from stainless steel and promises easy cleaning, easy maintenance, and extreme durability. It features a polished milled steel griddle plate cooking surface for maximum heat retention and even heating across the entire cooking surface. Cecilware is a name that has been associated with professional restaurant equipment for over one hundred years. This commercial grade electric flat top grill rises to the Cecilware reputation for quality professional products. 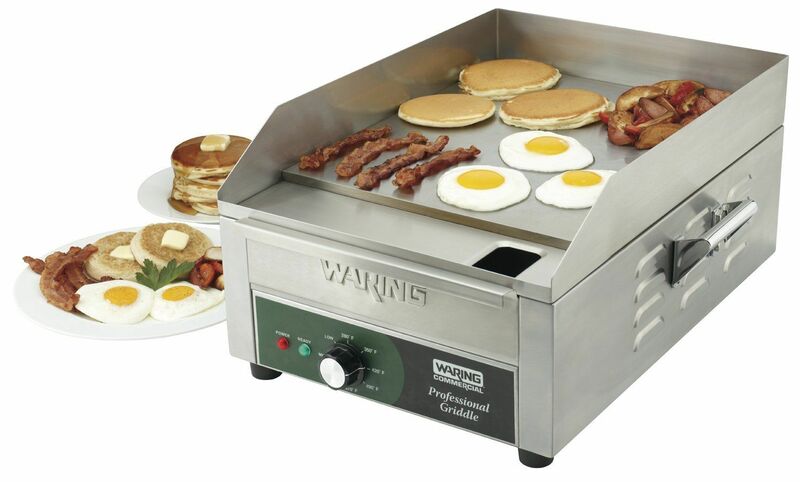 This is a truly professional grade all purpose electric griddle that weighs in at 117 lbs. If this electric griddle is chosen for purchase it will require a dedicated position in the kitchen for storage and use so available space should be considered before ordering the Cecilware stainless steel 36-inch electric commercial griddle. The temperature control of this unit allows the user to adjust the cooking temperature as needed. There are two power switches and two temperature setting control knobs allowing the user to engage both heating elements as they see fit. Since each element is individually controlled it allows the user to cook two different items at once even if they require two different cooking temperatures. This commercial electric griddle features a high-temperature setting limit of 570 degrees. 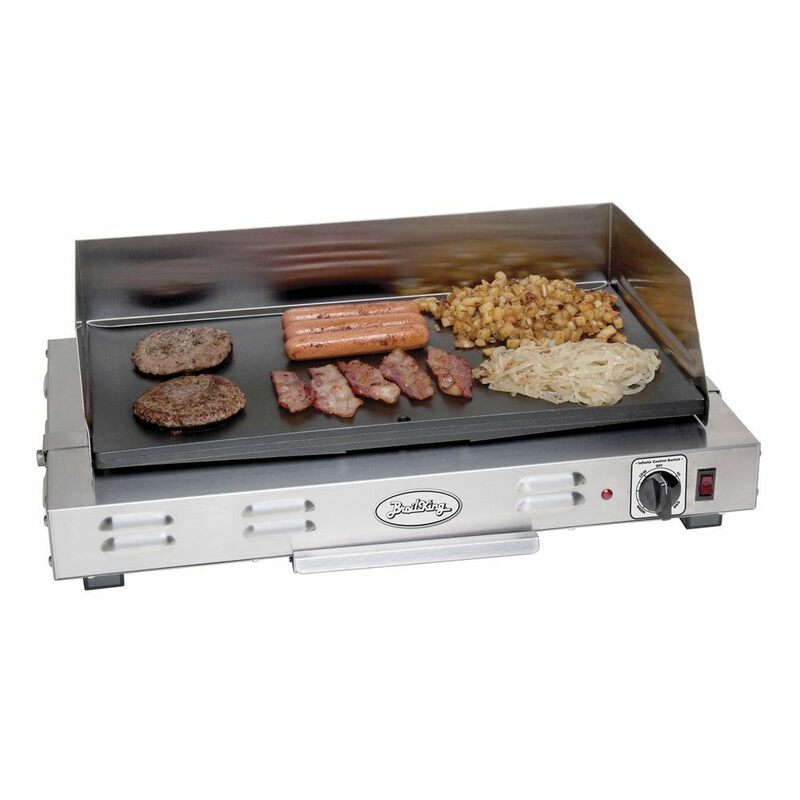 Users report that the high setting makes this griddle ideal for cooking steaks and chops, as well as burgers and hot dogs. The concealed commercial style grease trap is fully removable for easy cleaning and extra large in size to minimize greasy overflow when cooking large amounts of bacon, sausage or other meats. This electric professional griddle is one of the newest models of the commercial griddle for sale anywhere and it received high marks from food service professionals. Several professionals reported that its sturdy design is similar to restaurant flat top griddles and can match most restaurant griddles in quality and consistency of the product. Overall, the Grindmaster-Cecilware ﻿﻿﻿electric griddle commercial model was well liked by professional chefs. It has received no critical reports to date. The Broil King CG-10B Commercial Griddle is a professional grade electric appliance that is manufactured from stainless steel with a large heavy cast non-stick 21in x 12in cooking surface and stands 8in high. 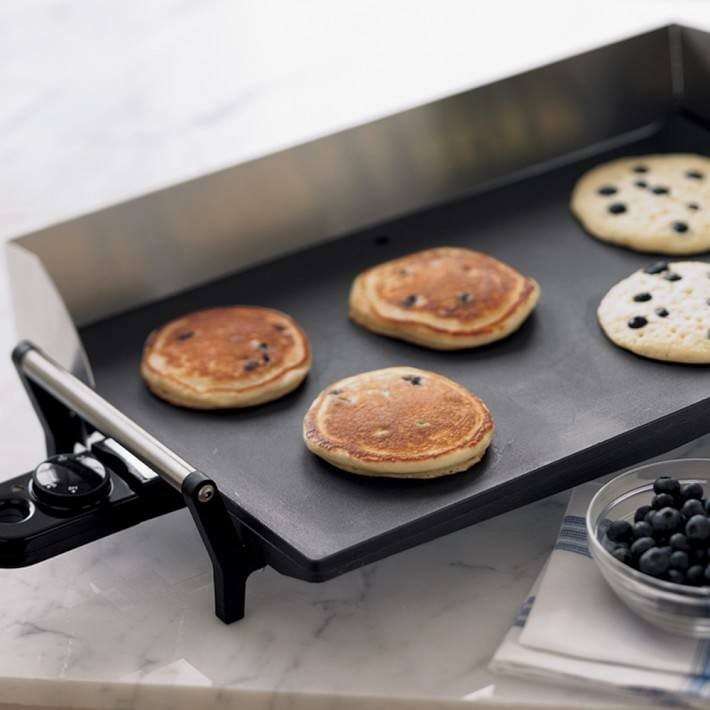 This electric griddle commercial model features a large sized fully removable professional style drip tray for minimal mess while cooking and ease of cleaning. It also features a removable stainless steel backsplash that works to minimize any splattered grease mess. The heat control/thermostat is made by Robertshaw for consistent, infinite, even heating up to 450 degrees across the entire cooking surface. Includes on/off switch and indicator light for maximum safety. 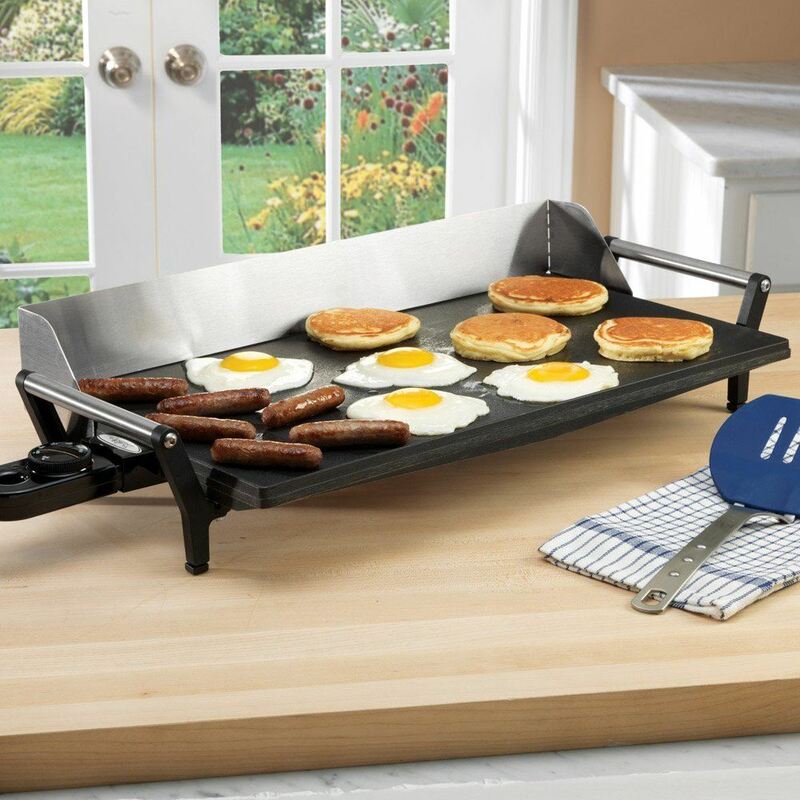 Purchasers like this griddle for the size as it allowed them to prepare several pancakes or slices of french toast at one time. Users commented that the non-stick property was very good. Several users commented that the grill cooking surface does not become hot enough to sear steaks or chops and gets barely hot enough to cook burgers. They also reported that the temperature is fairly uneven across the cooking surface. One user measured the temperature and consistently found a 40 degree spread between the temperature on one side of the griddle and the temperature on the other side. Users reported that the removable splash guard is good at catching the splashes, but when it is removed it leaves nooks and crannies that can be difficult to clean. Other users reported that the drain into the drip tray was very small so would only allow a small amount of drippings to drain at once, so the grease could overflow the grill surface if not carefully watched. Overall, the Broil King CG-10B Heavy Duty﻿ commercial electric griddle was well liked for cooking breakfast or brunch items. It was not well liked for cooking meats with higher temperature requirements. Care should always be taken when choosing a commercial electric griddle. Every source should be consulted in order to ensure that the best product is chosen for the need that is being filled. Each commercial electric griddle reviewed meets the standards for commercial cookware. Two of the griddles were from Broil King and they both did well overall with buyers. However, there were some issues with even heating and ease of cleaning that some purchasers did not like. Also, both of the Broil King commercial electric griddle models have relatively low maximum heat settings. The Broil King PCG-10 has a maximum temperature setting of only 425 degrees and the Broil King CG-10B has a maximum temperature setting of 450 degrees, neither of which is a high enough temperature to safely cook steaks, chicken or chops. The Waring WGR-140 Commercial Electric Countertop Griddle is a favorite of food service professionals and amateur chefs alike. The griddle is easily cleaned and has a professional style easy to manage grease trap design for minimal mess. The maximum cooking temperature of 570 degrees makes the Waring ideal for cooking steaks or other meats that require higher temperatures for safe cooking. The Grindmaster-Cecilware EL1636 Stainless Steel commercial electric griddle is the newest model out of the one evaluated and it promises to be a best seller. 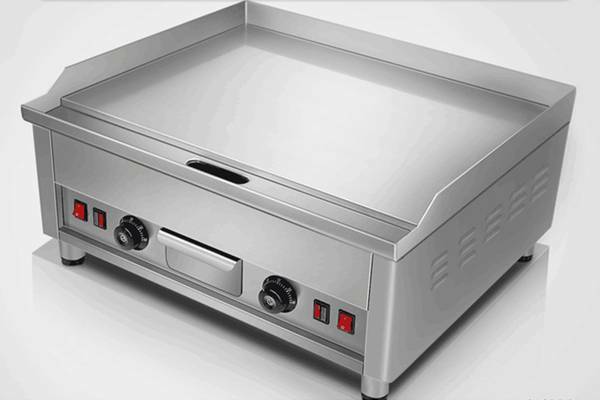 From the professional grease trap design to the high cooking temperature limit of 570 degrees, this electric griddle commercial model delivers on almost every point of satisfaction. When all of the variables are considered and all of the options are weighed, the commercial electric griddle that best fits the need is the commercial electric griddle that will bring the most satisfaction to the end user.